A robust Alberta Clipper will dive southeast into the Midwest tonight and into Sunday. It will not have much moisture to work with, but the strong pressure gradient will serve as the driving force for strong and gusty winds. Snow amounts will be on the lighter side, with a narrow band of 2-4" and maybe an isolated 5" amount in eastern Iowa or northern Illinois and points east. 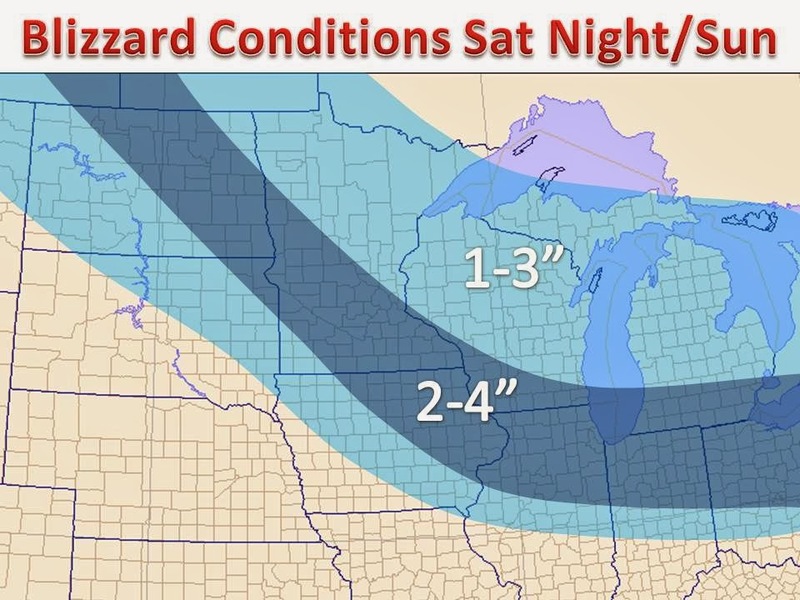 Although amounts will be light blowing and drifting will be a major issue. Blizzard watches are in effect and will likely switch over to a blizzard warning later today. Road closures are possible in the locations that usually see them. The snow will also be light and fluffy causing more problems as any snow plowed off the roads will have the tendency to blow back. Along with the snow, extreme cold temperatures will be ushered in after the storm passes and wind chills will really ramp up by early next week, see previous post.